It's reasonable to assume that much of the new information in the New York Times report relates to leakers' fears about information that will be coming out in the inspector general report. The story says the FBI was worried that if it came out they were spying on Trump campaign it would “only reinforce his claims that the election was being rigged against him.” It is easy to understand how learning that the FBI was spying on one’s presidential campaign might reinforce claims of election-rigging. People leak for a variety of reasons, including to inoculate themselves as much as they can. For example, only when the secret funders of Fusion GPS’s Russia-Trump-collusion dossier were about to be revealed was their identity leaked to friendly reporters in the Washington Post. In October of 2017 it was finally reported that the Clinton campaign and Democratic National Committee secretly paid for the Russia dossier, hiding the arrangement by funneling the money through a law firm. The friendly reporters at the Washington Post wrote the story gently, full of reassuring quotes to downplay its significance. The information only came about because House Permanent Select Committee on Intelligence Chairman Devin Nunes subpoenaed the bank records of Fusion GPS, over the objections of Democrats on the committee. Even in this Times story, Clinton’s secret funding was not mentioned. Likewise, the admissions in this New York Times story are coming out now, years after selective leaks to compliant reporters, just before an inspector general report detailing some of these actions is slated to be released this month. In fact, the Wall Street Journal reported that people mentioned in the report are beginning to get previews of what it alleges. It’s reasonable to assume that much of the new information in the New York Times report relates to information that will be coming out in the inspector general report. In paragraph 69 of the lengthy story, The New York Times takes itself to task for burying the lede in its October 31, 2016, story about the FBI not finding any proof of involvement with Russian election meddling. No evidence of collusion after two years of investigation with unlimited resources? You don’t say! What could that mean? Thanks to the work of the House Permanent Select Committee on Intelligence and the Senate Judiciary Committee, Americans already learned that the FBI had secured a wiretap on Carter Page, a former Trump campaign official. That wiretap, which was renewed three times, was already controversial because it was secured in part through using the secretly funded opposition research document created by the Hillary Clinton campaign and Democratic National Committee. The secret court that grants the wiretap was not told about Hillary Clinton or the DNC when the government applied for the wiretap or its renewals. Now we learn that it wasn’t just Page, but that the government was going after four campaign affiliates including the former campaign manager, the top foreign policy advisor, and a low-level advisor whose drunken claim supposedly launched the investigation into the campaign. The bureau says Trump’s top foreign policy advisor and future national security advisor — a published critic of Russia — was surveiled because he spoke at an event in Russia sponsored by Russia Today, a government-sponsored media outlet. This paragraph is noteworthy for the way it describes spying on the campaign — “at least one government informant met several times with Mr. Page and Mr. Papadopoulos” — before suggesting that might not be spying. The definition of spying is to secretly collect information, so it’s not really in dispute whether a government informant fits the bill. Despite two years of investigation and surveillance, none of these men have been charged with anything even approaching treasonous collusion with Russia to steal a U.S. election. The House Permanent Select Committee on Intelligence recently subpoenaed information from the FBI and Department of Justice. They did not publicly reveal what information they sought, but the Department of Justice responded by claiming that they were being extorted by congressional oversight. Then they leaked that they couldn’t share the information because it would jeopardize the life of a government informant. They also waged a public relations battle against HPSCI Chairman Nunes and committee staff. It is unknown at this point whether the informants were specifically sent by a U.S. agency or global partner, or whether the sources voluntarily provided information to the U.S. government. Of course, it was previously reported that Strzok had a meeting with the Australian ambassador. He describes the embassy where the meeting took place as the longest continually staffed embassy in London. The ambassador was previously reported to have had some information about a Trump advisor saying he’d heard that Russia had Clinton’s emails. It’s also inaccurate to say this was “election meddling,” necessarily. Clinton had deleted 30,000 emails that were housed on her private server even though she was being investigated for mishandling classified information. This could be viewed as destruction of evidence. She claimed the emails had to do with yoga. FBI Director James Comey specifically downplayed for the public the bureau’s belief that foreign countries had access to these emails. There is no evidence that Russia or any other country had these emails, and they were not released during the campaign. To describe this legitimate national security threat as “election meddling” is insufficient to the very problem for which Clinton was being investigated. The story claims, “News organizations did not publish Mr. Steele’s reports or reveal the F.B.I.’s interest in them until after Election Day.” That’s demonstrably untrue. Here’s an October 31, 2016, story headlined “A Veteran Spy Has Given the FBI Information Alleging a Russian Operation to Cultivate Donald Trump.” It is sourced entirely to Steele. In September, Yahoo News’ Michael Isikoff took a meeting with Steele then published “U.S. intel officials probe ties between Trump adviser and Kremlin” on September 23, 2016. That story was even used in the Foreign Intelligence Service Act application against Page. Another New York Times error was the claim, repeated twice, that Page “had previously been recruited by Russian spies.” In fact, while Russian agents had tried to recruit him, they failed to do so, and Page spoke at length with the FBI about the attempt before the agents were arrested or kicked out of the country. 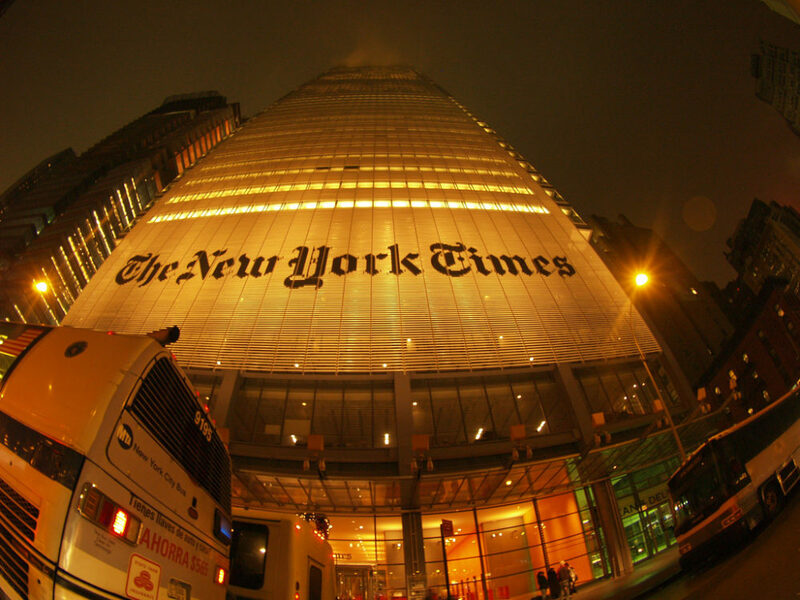 The New York Times falsely reported that “Mr. Comey met with Mr. Trump privately, revealing the Steele reports and warning that journalists had obtained them.” Comey has told multiple journalists that he specifically did not brief Trump on the Steele reports. He didn’t tell Trump there were reports, or who funded them. He didn’t tell him about the claims in the reports that the campaign was compromised. He only told him that there was a rumor Trump had paid prostitutes to urinate on a Moscow hotel bed that the Obamas had once slept in. The story also repeats long-debunked claims about the Republican platform and Ukraine. 8. Insurance: How Does It Work? The article’s repeated claims that the FBI didn’t think Trump would win do not counter the notion that an “insurance policy” investigation was in the extremely rare case he might win. People don’t insure their property against fire damage because they expect it to happen so much as they can’t afford to fix things if it does happen. “[P]rosecutors obtained court approval to eavesdrop on Mr. Page,” The New York Times writes, making the wiretapped spying on an American citizen sound almost downright pleasant. When Comey briefs Trump only on the rumor about the prostitutes and urination, we’re told “he feared making this conversation a ‘J. Edgar Hoover-type situation,’ with the F.B.I. presenting embarrassing information to lord over a president-elect.” Reporters don’t ask, much less answer, why someone fearing a J. Edgar Hoover-type situation would go out of his way to create an extreme caricature of a J. Edgar Hoover situation. The story also claimed, “they kept details from political appointees across the street at the Justice Department,” before using controversial political appointee Sally Yates to claim that there was nothing worrisome. In fact, the subtext of the entire story is that the FBI showed good judgment in its handling of the spying in 2016. Unfortunately, the on-the-record source used to substantiate this claim is Yates. Yates, who was in the news for claiming with a straight face that she thought Flynn had committed a Logan Act violation, is quoted as saying, “Folks are very, very careful and serious about that [FISA] process. I don’t know of anything that gives me any concerns.” If Yates, who had to be fired for refusing to do her job under Trump, tells you things are on the up and up, apparently you can take it to the bank. This New York Times story may have been designed to inoculate the FBI against revelations coming out of the inspector general report, but the net result was to affirm the fears of many Americans who are worried that the U.S. government’s law enforcement and intelligence agencies abused their powers to surveil and target Americans simply for their political views and affiliations. The gathered information has been leaked to media for years, leading to damaged reputations, and the launch of limitless probes, but not any reason to believe that Trump colluded with Russia to steal an election.